The Halifax Reader - Halifax Public Libraries: It's Marathon Monday! Today 30,000 eager marathoners will make their way to Hopkinton with the goal of running 26.2 miles to a famous finish line on Boylston Street in Boston. For many runners, qualifying for the Boston Marathon is a goal, a hope, a dream. For most it requires a high level of dedication and, for some even that is not enough. If you are someone who is looking to take your running to the next level, there are numerous books with advice that can help. If Daniels program sounds far too complicated, the Hansons Marathon Method by Luke Humphrey with Keith and Kevin Hanson offers a simple yet effective alternative. Keith and Kevin Hanson are the founders of the Hanson-Brooks Distance Project, a highly successful Olympic development program based out of Michigan. This book brings their training philosophy to the masses. Compared to Daniels' book, the workouts in the Hanson plans are extremely straightforward – there are no complicated workouts requiring three minutes of running at one pace followed by ten minutes at another ad nauseam. The basis of the program is one intervals session and one tempo run (performed at a speed equivalent to goal marathon pace) per week. The success of these plans appears to be based on achieving overall higher mileage (committing to 6 days a week), while decreasing the burden of the weekly long run that is a staple in most marathon training plans. Training plans are not the only factor that can be addressed in order to improve running performance. Cross training is an excellent way to improve fitness and build resistence to injury. Yoga is very popular, but not all yoga is equal. Yoga for Runners by Christine Felstead presents the benefits of yoga in the context of a runner’s body with emphasis on achieving a balance body and preventing injury. It is a very well organized book with chapters that focus on isolated parts of the body - a huge help to anyone who has a specific problem and limited time to devote to a yoga practice. There is a chart that allows you to select poses that will help with an existing injury as well as information on modifications that can be made to poses to accommodate injuries. There is also a selection of yoga sequences that cover a variety of circumstances: post-workout, weekly tune-up, runner’s hot spots, etc. In my experience, one of the biggest changes a runner can make when trying to break through a training plateau is to incorporate a strength routine into their training plan. 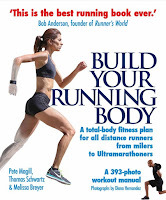 Build Your Running Body by Pete Magill, Thomas Schwartz, and Melissa Breyer offers up “the Runner 360,” a short sequence of body-weight exercises that help develop functional strength with minimal time commitment and no gym membership required. There are also sections on how to train for improvements in other seldom addressed areas such as the nervous system, connective tissue, hormones, etc. Throughout the book there are interesting sidebars that present opinions on a wide variety of topics within the running world (minimal shoes, heart rate training, energy gels) that many experienced runners are curious about. Nutrition is another frequently overlooked factor that has a significant impact on athletic performance. Nancy Clark's food guide for marathoners : tips for everyday champions is an accessible guide for sorting out a nutrition plan. Nancy Clark has published extensively on the subject of sports nutrition and offers good advice on balancing carbohydrates, protein, and fat, as well as information on hydration, supplements, and food timing. I hope these resources are helpful. Good luck, runners! Interesting! I did a similar post on my blog. Is primarily about which yoga type you are and what yoga you should practice Many tips and more if you are interested!